Comparison of Implicit Skinning with our new Elastic Implicit Skinning. From right to left: Jeff in T-pose, Jeff rigged with implicit skinning, Jeff rigged with elastic implicit skinning, female model with implicit skinning then elastic implicit skinning. 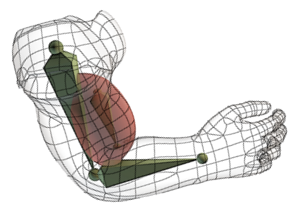 (b) Artists can safely add additional shapes to simulate muscle bulge. 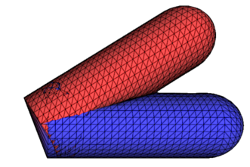 (c) Implicit skinning fails when applied over a rigid skinning (i.e. skinning weights are either 0 or 1). (d) Elastic implicit skinning automatically distributes the vertices: no skinning weights required! Only mesh partitioning. We present elastic implicit skinning, a novel approach for interactive character skinning. The method simulates skin contacts between limbs as well as the effect of skin elasticity. In addition, we go a step further towards the automation of the rigging process: our method doesn't require the definition of skinning weights. Elastic implicit skinning takes the best features of the recent implicit skinning method, and makes it robust to extreme character movements. While keeping the idea of implicit skinning, namely approximate the character by 3D scalar fields in which mesh-vertices are appropriately re-projected, we depart from the processing pipeline used so far. Implicit skinning is history independent and use an initial skinning solution (e.g. linear blending or dual quaternions) to correct vertex positions at each frame. Our approach is history dependent, the mesh directly tracks the iso-surfaces of the scalar field over time. Technically our solutions include: new implicit surface composition operators and a tangential relaxation scheme derived from the as-rigid-as possible energy. You can find codes at the old implicit skinning 2013 project page. 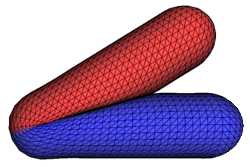 Codes specific to the elastic implicit skinning are not yet available. We thank artists, companies and universities who provided us with nice 3D models and animations. Laura Paiardini (http://laurapaiardini.rd-h.fr/) from Inria Grenoble provided us with the skeleton animation of the Armadillo and Garrett Pond from Brigham Young University (BYU) modeled the Jeff wich is the big guy from the short movie 'Owned'. Finally the famous armadillo model comes from the Standford university 3D scan repository. We also thank the blender foundation as 90% of our renderings are done with Blender with either the "cycle renderer" or the "internal renderer". This work has been partially funded by the IM&M project (ANR-11-JS02-007) and the advanced grant EXPRESSIVE from the European Research council. Partial funding also comes from the Natural Sciences and Engineering Research Council of Canada, the GRAND NCE, Canada and Intel Corps. Finally, this work received partial support from the Royal Society Wolfson Research Merit Award. Absolutely amazing! This is a revolution! Do you know if your search had been ported to a Maya plugin ? Est-ce que vous savez si vos recherches ont été portées vers un plugin Maya ? "I'm afraid we are at a loss here - apart from the tip above to edit xorg.conf I don't have a clue"